Welcome to the Chenango County All-Hazard Mitigation Plan homepage. 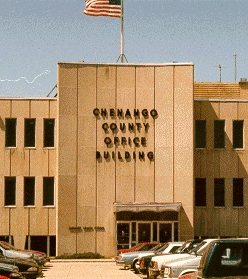 Chenango County and many of its residences have suffered greatly over the past several years due to naturally occurring disasters. Our residences have experienced damage and suffering from ice storms, tornados, and flooding. To help in reducing the probability of this suffering occurring again Chenango County and the local municipalities within the county have bonded together to create an All-Hazard Mitigation Plan. Once completed this plan will offer a significant opportunity to reduce the losses created by natural disasters. Chenango County is committed to reducing the risks associated with natural disasters and in limiting hardship created by those events. The Chenango County Department of Planning and Development and the Bureau of Fire is leading a project to update the 2008 County-Wide Hazard Mitigation Plan (HMP). All municipalities have committed to participating in this planning project. The creation of these plans will help the area to better prepare for, respond to and recover from hazard events and disasters, and allow the County and municipalities to maintain their eligibility for federal mitigation grant funding from the New York State Office of Emergency Management (NYSOEM) and Federal Emergency Management Agency (FEMA). This is an opportunity for the County and municipalities to create a detailed plan that will address a variety of potential hazards that could affect our residents, businesses and other institutions. The goal of the HMP is to identify projects that can reduce damages from future natural hazards. The plan will include a risk assessment and a hazard-mitigation strategy. This plan will address the County and municipality’s risk to flooding, severe storms, severe winter storms, extreme temperatures, wildfires and other natural hazards. Mitigation projects and initiatives will be identified to address these risks to both public and private property. The public and local and regional stakeholders are encouraged to provide input to the planning process. Chenango County residents are encouraged to take our online Citizen Hazard Preparedness and Mitigation Survey. The term "hazard mitigation" describes actions that can help reduce or eliminate long-term risks caused by hazards, or disasters, such as floods, severe storms, severe winter storms and wildfires. As the costs of disasters continue to rise, governments and citizens must find ways to reduce hazard risks to communities. Efforts made to reduce hazard risks should be compatible with other community goals; safer communities are more attractive to employers as well as residents. As communities plan for new development and improvements to existing infrastructure, mitigation can and should be an important component of the planning effort. Structure and Infrastructure Project (SIP) – These actions involve modifying existing structures and infrastructure to protect them from a hazard or remove them from a hazard area. This could apply to public or private structures as well as critical facilities and infrastructure. This type of action also involves projects to construct manmade structures to reduce the impact of hazards. Sections of the Draft Plan are provided below as they become available for public review. You may also download a zip archive containing the indexed PDF component sections (open index.html after extracting the archive).